I spent the day sneaking through air vents and trying to keep my cat off my keyboard. But then I remembered I have a kitten, and books, and video games. I just shoveled out my driveway, again. It’s so quiet when it snows, because the cars don’t whiz by at 50 MPH on the local arterial. I’d like snow a lot if it didn’t make it so hard to get anywhere. Ok, from an observer who is biased toward my own cats, and thus against yours… that’s a good looking cat. That beauty shot is seriously gorgeous. I do love a cat with blue eyes. Your cat has teh pretty. We had snow in CT a couple nights ago. I was looking forward to nice pictures when the sun came up. Got out of bed… all the snow gone. That is a fantastic picture of your master. OK, here is your gratuitous Canadian comment: Snow? That’s not snow. That’s just a light dusting. There, I feel better for having made a somewhat condescending comment. Ciao. I’m not even a cat person, and that is a gorgeous cat. On Saturday, our forecast for Calgary was snow all week. We got a little. Big chilly, -31°C last night, but only -29 for tonight. Cujo359: I really enjoy the quiet brought by a good snowfall. I like religious holidays for the same reason – they keep a lot of cars off the streets for a few hours. Very pretty kitty! Would you like some mousies? I haz some that I’d rather not have, but I’m very fond of mouseses, so I’m waiting impatiently til it gets warm enough to evict them to the great outdoors whence they came. Pretty kitty! As always, too bad I’m allergic. But when I get a Labrador, I’m going to photograph the heck out of him or her. OMG! My cat’s name is name is Pixel too! oh wait… [reads more closely]. That is a beautiful carnivore you have there though. ^^^ you’re – damit I blame the stout. We had a blackout earlier this week, too, when a big chunk of Capitol Hill lost power. I was denied access to every single website on the Internet. Oh, and also video games. If you ask me, that’s going a little overboard on the protesting. Fortunately, books continued to work. And lucky for me, power was restored before sunset. Cat story to while away the time. Mixed in with a little science nerdery. 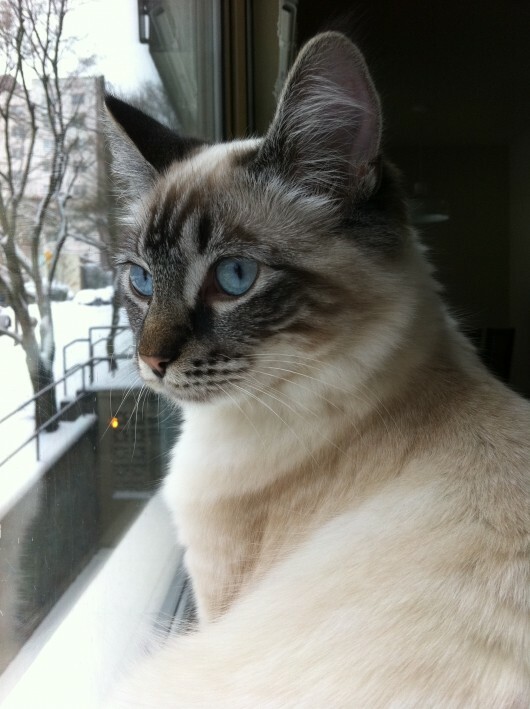 I had two cats like Pixel, but with the traditional Siamese face coloring – dark chocolate markings and those icy blue eyes. (From her face markings, it seems Pixel has some American Shorthair in her background). I named them Herschel & Hubble (after famous astronomers) and put a red collar on one and a blue on the other. A friend claimed I really only had one cat – but he was red-shifted when he was walking away from you and blue shifted when he was walking towards you. Alas, Hubble ran away from home and Herschel has a cranky & suspicious temperament. No fetching toys and sitting on laps for him. You lucky girl to have such a playful master! I’d call -31 Celsius (-24 F) “big” chilly. as the windchill factor would make it feel like -40 C (-40 F) or so. And wot a beautiful cat! Pixel’s face-markings are downright stunning. Ok, I give up. I’ve tried submitting a comment twice now, and it’s not going through. Lets see if this one does. LOL Love the snow comment. Living is Saskatchewan I ran OUTSIDE (we might be crazy here) in the 6 inches of powder we received on Sunday. Though I will admit the cold spell with its -40C days (not including the wind) is starting to make me grumpy. Holy crap, Pixel is a beautiful cat. Captured with an excellent photo, I might add. 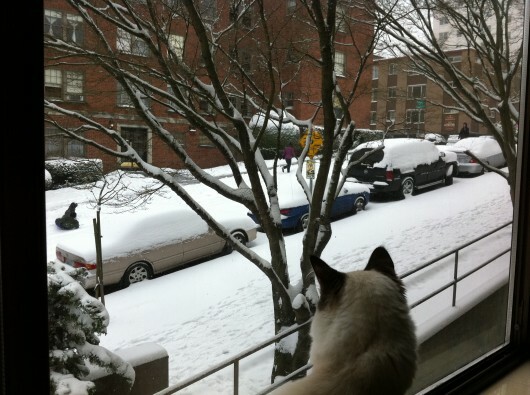 Has Pixel had a chance to go out and play in the snow yet? That beauty shot really lives up to the appellation! I keep saying: Losing Reddit is not much of a penalty…. OMFG that’s both a beautiful cat (she’s not a kitten in that shot) and a beautiful photograph.